Scored his first point vs Makedonikos with 1/2 free throws ,and his first basket @ Milonas . Made his best performance vs Near East scoring 15 pts (with 3/7 3p) pulling 5 rebounds and serving 4 assists . Scored a career high 21 pts (5/7 2p, 3/4 3p) vs Iraklis Salonika and voted MVP by the press for this Matchday . Scored again 21 pts (6/9 2p, 2/3 3p) vs Ionikos NF . Scored 10pts @ PAOK for the Cup. Tallied 19 pts and 5 assists vs Roma. Equalized his career high with 21 pts @ Panathinaikos (5/7 2p, 2/3 3p). Scored 20 pts (6/8 2p) and served 4 assist @ Makedonikos. Dished a career high 8 assists vs Villeurbanne. Scored 18pts (4/5 3p), dished 6 assists @ Panellinios. Dished a new career high, 13 assists vs Maccabi. Scored 21 pts @ Apollon with 7/7 1p, 4/4 2p, 2/3 3p. Scored 22 pts (4/6 3p) vs Efes, with a remarkable 3p shot which was the winning basket. Tallied 24 pts @ Olympiacos. Made his best performances @ Panionios when he scored 10pts with 2/3 3p in 00/01 , vs Ionikos NF in 01/02 when he scored 12 pts, vs Iraklis and Ionikos NF when he both scored 21 pts . Broke his record of 21 points, by scoring 22 pts vs Efes Pilsen in 04/05 Euroleague. Member of the National Team since November 2001 with 30 caps and 234 points so far . Won the Silver Medal and was the 1st scorer in 1999 European Championship for Cadets. Won the Bronze Medal in 2000 European Championship for Junior Men . Won the Gold Medal and was the MVP in 2002 European Championship for Young Men . Won the Silver Medal in 2001 Mediterranean Games . 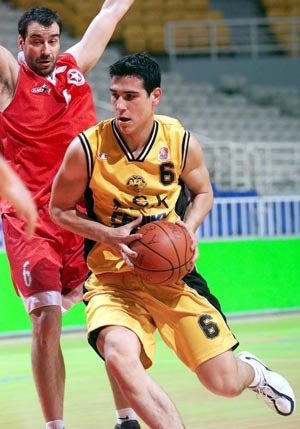 Won the Greek Cup with AEK in 2001. 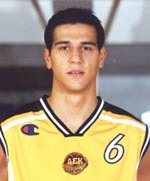 Won the Greek Championship with AEK in 2002 . Voted best under-21 player for the 2001/02 season . Voted in the best under-21 team for the 2003/04 season.